Sinn Fein 5 County Councillors as part of the Wexford County Council have put forward a submission in relation to the rail review published by the NTA & Iarnrod Eireann in November. The rail review identifies cost savings would be made by suspending Services on a number of lines in the Country including the Dublin to Rosslare Euro port line south of Gorey. 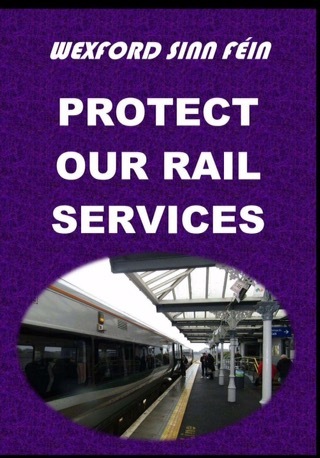 Our Councillors are emphatically opposed to the suspension of any rail services and view the rail services serving Wexford as critically and strategically important for the economic benefit of the Country. There are only 4 Scheduled services a day Travel time is slow and mainline services share a single rail line with Dart services from Greystones, this leads to reduce frequency and slow times. Review of fares to make it competitive with other forms of transport with monthly tickets for the peak journey times and for frequent users. The Wexford Story Doesn’t end in Gorey…Save the Wexford to Rosslare line. SaveTheRail.Org was first founded in 2010 as part of a community effort to save the South Wexford railway, and was associated with the later South Wexford Integrated Forum for Transport (SWIFfT). It is now a focal point for saving and regeneration of the entire Wexford rail network, hosted by several people who were activists for Wexford rail service during - and even prior to - 2010.